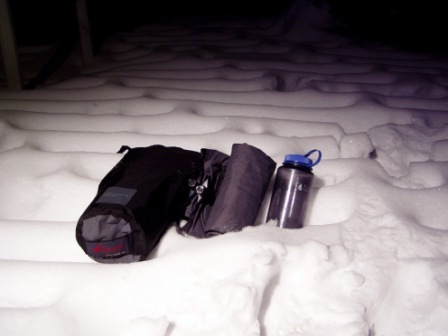 The Exped DownMat 7 Short comes packaged in its own dark navy blue, heavy-duty roll top cylindrical stuff sack (6" diameter x 17" length -- 15 cm x 43 cm) that doubles as an air pump to fill the sleeping pad. The bottom of the stuff sack has a one-way air valve with a 0.75" (2 cm) diameter opening in the center. This air valve is designed to fit snugly over the intake valves on the pad itself. The air valve on the stuff sack is protected by a plug that is attached in the middle of a 1.5" (4 cm) strip of fabric sewn to the outside of the circumference of the bottom of the stuff sack. The top opening of the stuff sack is lined around the outside with a 0.75" (2 cm) piece of flat webbing. On opposite sides of the opening, the two ends of a quick-release buckle are secured that allows the top to roll down and buckle in the fashion of many water-resistant stuff sacks and roll bags. Finally, the bottom 7" (18 cm) of the sack has a 0.25" (0.5 cm) thick piece of open cell foam lining the inside perimeter of the sack to assist in maintaining an open cylinder shape when using the sack as an air pump to fill the pad. The stuffed size of the sack with the rolled-up pad inside is about 6" diameter x 11" height (15 cm x 28 cm). The pad itself comes packaged folded into thirds down the length of the pad, with nearly all air removed and rolled up tightly. Upon unrolling and unfolding, the pad appears quite flat. Opening either or both of the wide-mouth intake valves at the corners of the pad near the head allow it to start self-inflating slightly. The top of the pad is a dark navy laminated polyester fabric with a slip-resistant honeycomb texture. The bottom of the pad is a flat grey fabric. There are two small loops at the head end of the pad spaced about 10" (25 cm) apart that are designed to secure a pillow via cord or straps. According to the manufacture's website, the pad is filled with 5 oz (130 g) of 700-fill goose down, treated with Nocar to eliminate the effects of humidity that may reach the pad�s interior. 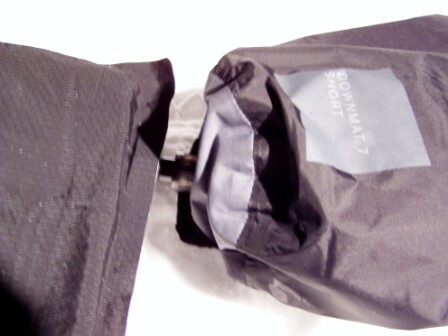 Seven baffles run nearly the full length of the pad, spaced approximately 3" (7.5 cm) apart, giving the inflated pad the appearance of a puffy down coat or sleeping bag. The baffles are designed to prevent down from shifting excessively within the pad. Strips of open cell foam run the width of the pad at either end to prevent down from escaping or shifting to other chambers. Two wide-mouth intake valves stick out at the head of the pad, about 2" (5 cm) from either corner. Though there are two valves, the entire pad can be filled using only one of the valves. The valves are 0.75" (2 cm) in diameter and stick out 1" (2.5 cm) from the pad when closed. They open and close with a quarter-turn and "lock" shut with a slight click action to ensure they are closed tightly. Care and use instructions are printed in several different languages and are attached to the stuff sack. A small bag is also included that contains two 4" x 5" (10 cm x 13 cm) swatches of fabric -- one that matches the top of the pad and one that matches the bottom. A small tube of textile glue is included in this bag. The fabric swatches and glue are designed to repair punctures or tears. The stuff sack is designed to act as a pump to fill the pad with air. (Note that because the pads are filled with down, filling the pads with breath should be avoided, as this will introduce moisture to the down and diminish the insulative value.) The one-way valve in the center of the bottom end of the stuff sack fits snugly over either of the air intake valves on the pad. With the one-way valve on the stuff sack secured to one of the air intake valves on the pad, the open end of the stuff sack can be opened to fill the sack with air. The open end can then be rolled toward the bottom end, forcing air through the one-way valve and filling the pad with air. If the pad is allowed to sit for a period of time with the valves open to self-inflate slightly before using the stuff sack as a pump, it takes approximately four full sacks full of air to completely fill the pad. If the pad has just been taken out of the stuff sack and has not had an opportunity to self-inflate, it takes approximately seven full sacks of air to fill the pad. Each full pump from the stuff sack takes me approximately 10 seconds to inflate the sack and force the air into the pad in a room-temperature interior environment. Depending on conditions, it may take longer in the field. Generally, the stuff sack will stay attached to the valve during the pumping process, provided that care is taken when securing the two together prior to filling. However, if air is forced too quickly through the valve, the pressure may be too great, and the stuff sack may detach. Some air may escape the pad before the valve can be closed and the stuff sack re-attached. This has happened to me on a few occasions in field use. Avoid forcing air too quickly into the pad. Before removing the stuff sack from the valve, it is important to twist the valve closed with the stuff sack still attached. This prevents air from escaping and allows the pad to remain fully inflated. Of course, the valves can always be opened momentarily to release a small amount of air for comfort. When stuffing the pad back into the sack, the manufacturer recommends to open both valves first, then roll the pad at full width from the foot to the head to force air out of the valves. Next, close the valves on the pad and unroll it. Fold it into half or thirds along the length of the pad and then roll it tightly toward the head. When it is nearly rolled up, open the valves to release the remaining air, close the valves and insert it into the stuff sack. This process takes me less than 60 seconds in a room-temperature interior environment. Again, it may take longer in the field depending upon conditions. * Multiple uses on a wooden deck in a backyard, under the stars. Overnight lows between 50 F (10 C) and 75 F (24 C). 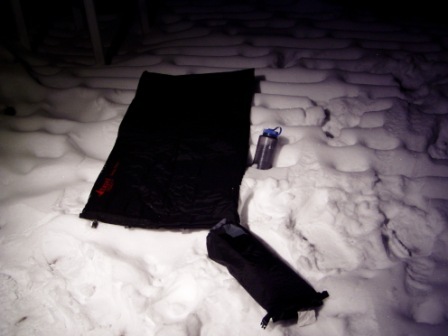 * Multiple uses on the ground, with and without a ground sheet underneath, under the stars. Overnight lows between -19 F (-28 C) and 75 F (24 C). * In the Boundary Waters of northern Minnesota, inside a tent pitched on a large rock. Overnight lows of approximately 35 F (2 C). * Multiple trips on the flanks of glaciated peaks, inside a tent pitched on cold ground, snow, or ice. Elevations up to 10,000 ft (3,050 M). Overnight lows several degrees below freezing. Significant precipitation (snow/sleet/rain) on one trip. * Multiple nights inside the Camp Muir shelter on a wooden platform. Overnight low inside the shelter approximately 45 F (7 C). * In a Hennessy Hammock hanging between two trees. Overnight lows approximately 20 F (-7 C). Thus far, I have been quite satisfied with the performance of the Exped DownMat 7. I have owned and used nearly a dozen different styles of sleeping pads over the years, and I find this pad to be by far the most comfortable and warmest of any others I have used. Because of the small packed size and relatively light weight (considering the warmth), it has become my pad of choice for any backpacking outing in any and all conditions. There are several different sizes of Exped DownMats, but I opted for this particular size to minimize weight and space in the pack. I find that the small size makes it easy to fill the pad with air -- even in a small, cramped tent -- as it must be laid out flat in order to pump efficiently. I typically use the stuff sack filled with a small amount of clothing off the head of the pad for a pillow. I lay my pack, clothing, or any other insulative article of gear at the foot of the pad for my feet. Even in temperatures down to -19 F (-28 C), I have not yet gotten cold from using this system. Initially, I was concerned that the fabric would be susceptible to damage that would cause air to leak out of the pad, but it has proven to be quite durable. I have used it on bare ground without a ground cloth with only slight dirt stains to show, which were subsequently wiped off with a moist cloth at home. The included patch kit offers a bit of insurance if anything ever did happen. My only concern is whether the patch kit would work in the field in temperatures far below the freezing point if the pad were compromised. The fact that the down is completely sealed inside a waterproof fabric is reassuring when using the pad in wet conditions. On one occasion, the floor of my tent had small puddles of water due to melting snow and moisture entering through the door when entering and exiting the tent, but I slept soundly knowing that my insulation beneath me would not be compromised from the moisture. The pad has also survived spills of hot beverages around camp, with no compromise of the insulation inside. Prior to using the pad, I was concerned about the additional time required to fill it with air using the stuff sack. However, through experience I have found it usually takes less than two minutes in field conditions to fill the pad with air, and less than two minutes to deflate and stuff the pad back into its stuff sack. It is more work than simply unrolling a closed-cell pad, but the additional time has been offset by the greater warmth and comfort, in my eyes. On one of my first outings with the pad, we set up our tent in blowing snow. My two tent mates had self-inflating pads. I was amazed at how comfortably and soundly I slept through the night, and expressed to my partners my extreme satisfaction with my new piece of gear. They both glared back at me while rubbing the kinks out of their backs and complaining of being cold throughout the night. I have found the pad to make a very comfortable and insulative chair when used in conjunction with a sleeping pad to chair conversion kit. (Exped sells their own version of a conversion kit, but I have used it successfully with a chair kit from another manufacturer.) I have never sat in camp in that great of comfort! On my most recent overnight outing, I experienced my first disappointment with the pad. I was inflating the pad under a clear and moonless sky when the ambient air temperature was approximately -10 F (-23 C) with no wind. Presumably due to a slight change in the size of the valves from the low temperature, the valve on the stuff sack slipped easily off the air intake valve on the pad. With great care -- and ultimately with the help of my trip companion, who held the sack and pad together while I pumped -- I was able to fill the pad with air in approximately 10 minutes. It was a bit frustrating to experience this issue considering the ease with which I had filled the pad previously. However, once the pad was inflated, it provided sufficient insulation from the hard packed snow on the ground. The temperatures dropped as low as -19 F (-28 C). Only my extremities felt cold, but I attribute that to the fact that I opted to use a down suit rather than a sleeping bag for insulation. 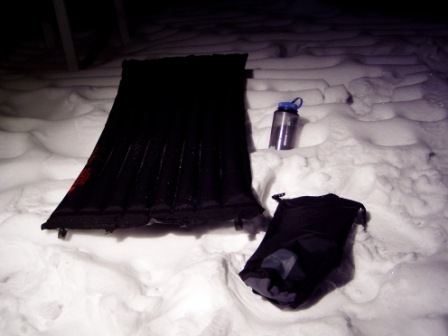 My core felt warm and comfortable through the night. Though it took longer than I had expected to inflate the pad in the low temperatures, I was still glad I had the 3" (8 cm) of insulation beneath me. Next time I venture out in temperatures that low, I plan to wrap a thin strip of athletic or duct tape around the valve on the pad, hoping that it will create a better seal while inflating the pad. In summary, I have been extremely happy with this product. It meets or exceeds all my expectations I had of the product when purchasing it. I intend to continue to use it for the foreseeable future for nearly all my overnight outings in which I carry my gear on my back to the destination. The extreme comfort and insulation are worth the few compromises I have noted here. PROS: Extreme comfort and insulation. Great comfort-to-weight ratio. 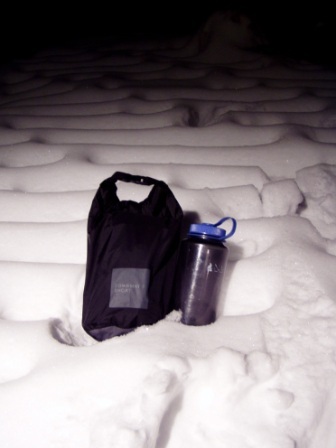 Small packed size and compressibility mean it can be kept with a sleeping bag in one stuff sack. Waterproofness and durability mean it can be used in a variety of conditions with little worry. CONS: The additional time needed to inflate and deflate -- especially in temperatures far below freezing. The fact that it must be used in conjunction with the stuff sack or pillow pump accessory to inflate and the inconvenience when the stuff sack slips off the intake valve. 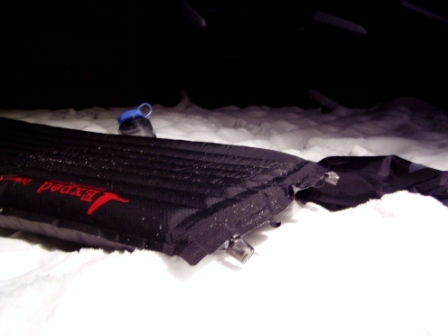 The smaller size of a short pad means that other insulation must be improvised for the lower body. However, it should be noted that these were all compromises that I intentionally made and feel that they are outweighed by the benefits of using the pad. This report was created with the BackpackGearTest.org Report Writer Version 1. Copyright 2007. All rights reserved.